Jul 19,2018Apacer Technology Inc., a leading company in the digital storage field, introduces the brand-new metal USB hard drive AH25B USB 3.1 Gen 1 and AH23B USB 2.0. The products are designed with the finest quality metal techniques to create ultra-light touch. The mixed and compatible Deep Valley Black and Sunrise Red respectively reflect the cool and passionate style to manifest the unique taste of the user. With a maximum capacity of 128 GB, it allows for the storage of massive amounts of data, audio and video files, letting you enjoy your life carefree! Matte finish for a portable and fashionable digital life The fashionable matte touch of the AH25B USB 3.1 Gen 1 and AH23B USB 2.0 presents the low-keyed fine art of metalworking techniques. The products are elegant and classy. With a unique "Contrast Design" approach, Apacer's design team combines the matte metal shell with a translucent cover to form a dual sight and touch contrast, add more aesthetic gradations with joyfulness when using the products. The smooth matte body is anti-drop and wear proof so that the user doesn’t worry about getting fingerprint marks on it. Also, they can protect important data from losses in case of collision and damage. Unique contrast design of coolness and passion The "Sunrise Red" AH25B USB 3.1 Gen 1 uses the USB 3.1 Gen high-speed transmission up to 5Gb/s. The high contrast of red and black highlights the unique passionate nature of the product. The "Deep Valley Black" AH23B USB 2.0 reflects the cool and professional image of the user with a mysterious black matte body. The strong distinction manifests the theme of "Contrast Design" and brings more selectable styles for the user. Ultra-high 128GB capacity for both professionals and amateurs using portable devices The metal AH25B USB 3.1 Gen1 and AH23B USB 2.0 provides a selection of 8GB, 16GB, 32GB, 64GB, and 128GB versions. 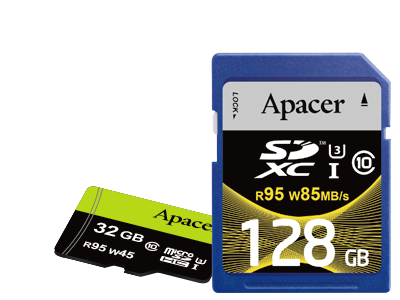 The 128GB can store up to 33,000 photos of 800 million pixels or Full-HD films up to almost 60 hours. It allows carrying mass data for portable applications and realizing a digital life of unrestricted mobility! Apr 23,2018Only the best of craftsmanship can achieve the finest. 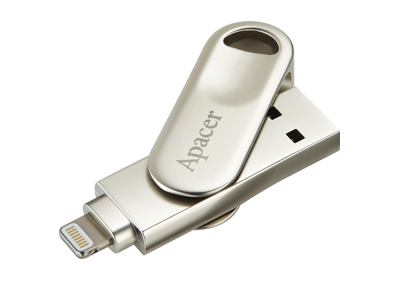 Apacer introduces AH13B, a high quality cap-less USB flash drive encrusted in a single-piece structure made of zinc alloy. A specially designed strap hole located at the tip complements the already neat style with an asymmetrical trimming edge. The COB technology keeps the unit protected from water, dust, and shock. Each AH13B is presented with dedicated leather case and key chain for the best of convenience. Triple Protections with Metallic Streamline Design Apacer AH13B USB flash drive is built with high-strength zinc alloy that has a mirror surface finish. The cap-less design characterizes the sleek exterior with a refined look. The ergonomic size and asymmetrical trimming edges make insertion and removal easier than ever. The COB technology offers protections against water, dust and shock, ensuring common accidents in daily life will cause no harm to the data stored inside, realizing a carefree mobile life. A Fine Quality Leather Case for Storage Combining stylish looks and practical features, AH13B ensures user never has to worry about losing a cap or important data. The strap hole at the tip allows attachment to personal items. Also, a quality leather case and a beaded chain are included with AH13B to offer a sophisticated, exquisite touch, making it ideal as a gift or personal collection. You can carry precious memory with you in a stylish and fashionable way. Large Capacity Meets All Your Storage Needs AH13B adopts USB 2.0 interface, the most widely accepted interface which is compatible to most of the digital devices. Available in 3 capacities, 16GB, 32GB, and 64GB, AH13B can satisfy any storage needs, with a maximum of storing 17,000 photos, 15,000 songs, or 15 hours of HD videos. Having a stylish digital life is no longer difficult! Nov 02,2017Digital storage leader Apacer Technology Inc. has done it again! The company just celebrated its 20th anniversary, and is currently awarded for the 9th consecutive win with the 26th Taiwan Excellence. This year’s contest was participated by 578 companies, with 1209 products submitted. By virtue of Apacer’s excellent R&D strength and fully-optimized user experience, six products receive the Award, giving recognition to the wonderful performance of Apacer in storage applications. 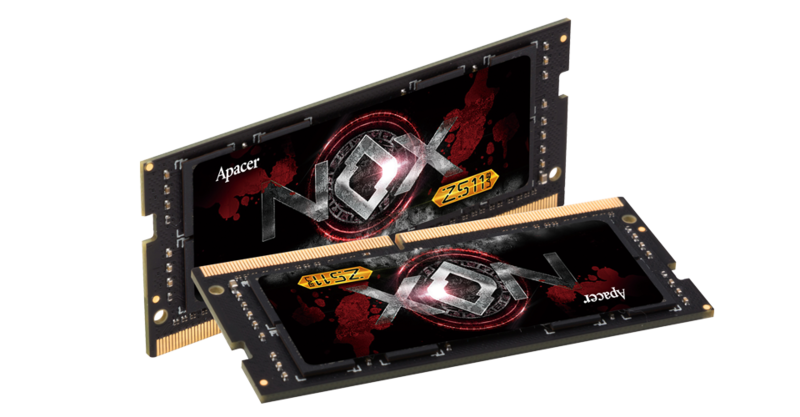 Apacer proved its expertise in digital memory and capability to invent and better serve user needs, optimizing experiences with superior performance. Apacer strives to reinvent and make breakthroughs; its strength is developed and proven in a wide array of fields, including embedded industry, gaming, mobility, and military-grade products. The award-winning inventions that received this year include: PM110-25 PCIe SSD, SV250-7 Multi-Power Path power technology, COMMANDO series DDR4 and PT920 PCIe SSD, ASMini Portable Mini SSD, and mil-spec portable hard drives AC630/AC631, and AC632. U.2 Mil-Spec SSD PM110.25 is a 2.5-inch SSD equipped with PCIe Gen3 x2 and Gen3 x4 interface, offering sequential read/write speeds up to 2,815/1,475MB/s and random read/write speeds up to 296K/238K IOPS. The unique design of exterior housing and internal intelligent temperature management system, which remarkably reduce overheating issues that are common for PCIe interface, allow fast dissipation and effectively make the system up to 30% cooler. Underfill technology is adopted to reinforce stability of components and prevent solder points from falling off or fracturing due to thermal expansion and contraction caused by extreme temperatures, which may further lead to system breakdown, while coating technology (conformal coating and IP57 nano-coating) is implemented to provide dustproof and waterproof features. SV250-7 Operates with the Innovative Technology, Multi-PowerPath SV250-7 is implemented with Multi-PowerPath technology, which provides three-option plug-and-play solution for power supply – cable type, Pin7 VCC and state-of-art 7+2 pin connector – on the side with cable-less design. With the exclusive, innovative power circuit mechanism, Multi-PowerPath protects miniature SSD from being damaged by overheating even when power is concurrently supplied via the three methods. Equipped with low-density parity check (LDPC) code, the product has a capacity of up to 256GB, with speeds up to 560MB/s in read and 530MB/s in write. Supporting AES-256 bit and TCG OPAL 2.0, the unit has a unique latch design and comes with CoreAnalyzer, an exclusive technology invented by Apacer for optimized operation. The system also comes with SSDWidget S.M.A.R.T for instant monitoring and reporting of the SSD health. Power Boost With COMMANDO DDR4 Desktop Gaming Memory Module and PT920 PCIe SSD Designed for serious gamers and system builders, COMMANDO Series-DDR4 & PT920 PCIe SSD take inspiration from an assault rifle and matches its design to fit gaming purposes. This DDR4 memory module is compatible with the latest Intel® and AMD platforms and functions with high frequency, low voltage, and low latency. PT920 SSD adopts PCIe Gen 3 x4, offering quadrupled bandwidth up to 2500MB in read and 1300MB in write. The swift actions brought by the COMMANDO series will complement each gaming session with superb performance. ASMini: Pocket SSD with Absolute Compactness Measuring at just 8.1cm x 5.4cm, ASmini is nearly the size of a name card, with only 0.6cm in thickness! Its compact dimension is some 85% smaller than the usual 2.5-inch external hard drives, offering unbeatable portability. Encased in a champagne tone metallic exterior, this finely designed piece can hold up to 240GB in memory, equivalent to around 6 hours of 4K videos, with an impressive read/write speed of 450/400MB. Shockproof, vibration-proof, and capable of functioning during access, ASMini is an excellent choice for data protection. AC630/AC631: Military-Grade Shockproof, Water Resistant, Dustproof, an Ideal Outdoor Companion Keeping outdoor needs in mind, AC630/AC631 is designed to be compliant with MIL-STD-810G 516.6 Procedure IV (Transit Drop Test) and IP55. The sporty appearance bears a sense of toughness in its single-piece anti-impact rubber structure, which also protects from accidents by easing external forces during impact. The thoughtful slot design keeps the cable neatly tucked along the body. The 3D surface texture of AC631 protects the appearance by preventing fingerprints and scratches. If you want to feel reassured when using a portable hard drive outdoor, AC630/AC631 is your best solution! 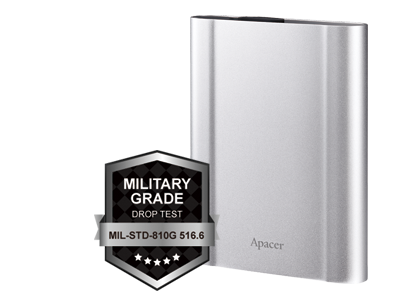 AC632: A Military-Grade Shockproof Portable Hard Drive with Excellent Anti Vibration Ability Against External Impacts AC632 is compliant with MIL-STD 810G 516.6 Procedure IV (Transit Drop Test). An uniquely built internal suspension structure keeps the core of AC632 protected at all times, effectively easing impact forces when dropped. The unit is created with an elegant and neat style : the aluminum alloy exterior has a rounded, corner-less design in a matte finish that keeps free from fingerprints. AC632 is made more compact compared to current metallic mil-spec products. At only 17.3mm in thickness and 245g in weight, the excellent portability makes it ideal for business professionals. 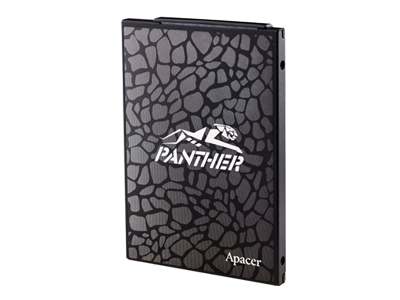 Aug 25,2017Apacer, a mobile storage solution expert, introduces AH790 dual interface swivel flash drive for iOS devices. Aesthetically built with zinc alloy and equipped with USB 3.1 Gen1 Type-A and Lighting connectors, AH790 is the speedy solution for file transfer between your PC and Apple devices. Paired with the Apacer iFileBridge app, you can manage your files efficiently with several exclusive features, such as “one-touch backup”, which instantly frees up your phone memory as you backup your files, or “capture-and-store”, which saves photos and videos directly into AH790 without ever occupying space in your phone. AH790 is an MFi certified product, fully compatible with iPhones and iPads. 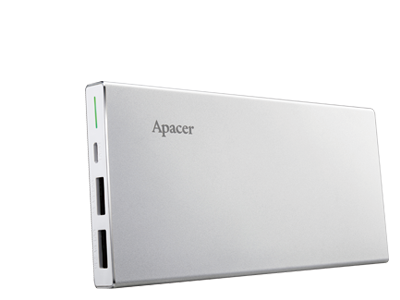 Easy File Sharing with Dual Interface AH790 is equipped with Apple Lightning and USB 3.1 Gen 1 Type-A dual interface. It is easy to transfer data between iOS devices, desktops, and laptops just by swivel and plug actions. 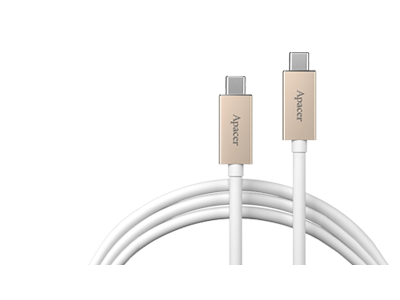 During use, the extended length design of Lightning connector facilitates easy insertion into any device, without having to remove a mobile phone’s protective cover. iFileBridge App Enables One-touch Backup and Direct Capture and Store TAH790 is built to overcome memory limitations in Apple products. iFileBridge, an exclusive app designed by Apacer, works to easily manage the files in mobile device and in AH790. The “One-touch backup” function can duplicate data from device to AH790, keeping all of contact list information, photos, and videos fully stored, while releasing your phone’s memory space. When performing memory-intensive actions such as photos and video recordings, there is no need to transfer files from your iPhone to AH790. With the “capture-and-store” feature, simply take high resolution pictures and videos and save them directly to AH790. Or you can use your AH790 as a personal theater; save the movies you want to watch, and let iFileBridge App play the video for you. 360-Degree Swivel Cap Design Zinc alloy is adopted to characterize AH790 with a quality and durability that is in line with the aesthetics of iPhone and iPad. The 360-degree swivel cap is designed to pause at four directions to make the spin more precise, always keeping the Lightning connector protected when not in use. The integrally molded strap hole is functional: you can attach your favorite accessory and turn your AH790 into a personalized charm. Apple MFi Certified: a Promise of Quality Certified by Apple MFi, AH790 functions with a superb quality. It is available in two memory capacities: 32GB and 64GB. With the potentials opened up by AH790, users can rest assured that their enjoyment with iOS products will no longer be limited by the default memory!